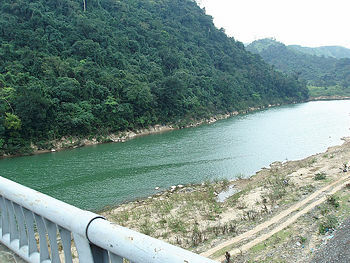 A view from the Dakrong Bridge, the start of the Ho chi Minh Trail. A general term for a complex logistical system, the Ho Chi Minh trail was a system of logistical facilities in North Vietnam, Laos and Cambodia that the People's Army of Viet Nam used to send troops and equipment into South Vietnam. It was operated by the 559th Transportation Group under then-senior colonel Dong Sy Nguyen, which was under the General Directorate of Rear Services. The commitment to build the trail came from a Politburo decision of May 1959, hence the name 559th Group; that was the date they decided to invade the South. 665th Transportation Group managing personnel movements to the South and evacuation of wounded to the North. Original planning was by engineer colonel Vo Bam. His initial plan started at the Mu Gia and Nape passes in the Annamite foothills within North vietnam, paralleled the Demilitarized Zone (DMZ) for 20 miles in Laos, and turned into South Vietnam proper at the intersection of the DMZ and the Laotian border. It then went north of Khe Sanh, crossed Highway 9, and then down the western border of South Vietnam, in and out of Cambodia and Laos. While the North Vietnamese had used the South China Sea to deliver supplies to the east coast of South Vietnam, U.S. naval forces essentially shut that route down. Those supplies that moved by sea came from Cambodia. Cambodia was not on the major ground route from the north, but the North Vietnamese regularly used the port of Sihanoukville to deliver supplies by ship, and then overtly trucked them, over Cambodian highway 4, to depots in the sanctuary at Kompong Speu. At that point, the PAVN became somewhat more discreet in moving materiel to the border crossings. By 1968, North Vietnam had essentially occupied parts of Cambodia, and its ruler, Prince Norodom Sihanouk, had stopped cooperating. Eventually, Sihanouk formed a "Salvation Government" with General Lon Nol as Prime Minister. While the Prince was traveling abroad in early 1970, Cambodian crowds stormed the Embassy of North Vietnam on March 11, and, on the 18th the National Assembly voted Sihanouk out and put Lon Nol in charge. At the beginning of April, PAVN forces brushed aside the Cambodian army and took control of areas they believed neded for logistics. This page was last modified 18:58, 4 July 2010.